This headband measures 4cm wide x 50cm length or circumference. Easy pattern for beginners to do. This is a simple pattern I made myself, using mainly chains and treble stitch patterns. Round 1: Tr st on 4th ch from hook. Then 1 tr st each ch, continue on the other side of the foundation chain once you finished the 14 chains on one side. To finish, ss to 3rd chain, top of turning chain. Round 2-5: ch 3, tr st in each tr st from previous round. Round 7 - 9: ch 3, tr st in each tr st from previous round. ss to 3rd ch of turning chain. Round 10: change to burgundy red yarn. ch 3, tr st in each tr st from previous round. Round 11 - 13: ch 3, tr st in each tr st from previous round. Rond 14: ss to each tr st from previous round till you reach 7th tr st. Then make 18 chains, ss to next tr st, position 8th tr st from start of this round. This makes to button loop. Then ss all around to finish, fasten off. Hello people! 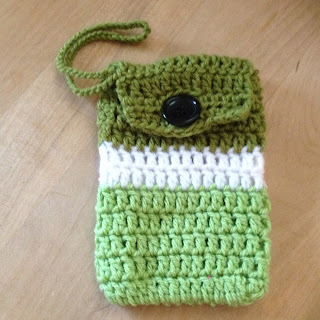 Looking for my next crochet project, and this time, I decide to make a small Iphone 4S cozy or bag to put my mobile phone. Row 1: Using colour A (lime sorbet) acrylic yarn, Dc into the fourth chain from the hook, then 1 dc in each chain. Once you reach 14th chain and made the dc, continue on the other side of the chain, and do 1 dc in each ch that already has a dc. To finish, slip stitch to top chain (3rd ch) of the turning chain. Row 6-7, change to white yarn, colour B. Repeat row 1 instructions. Row 8: change to colour C, then repeat row 1 instructions here to row 11. To make a handle or loop for the cozy, I chained a length I felt comfortable with, I think around 60-80 single chains, then slip stitch back to the space between the chain three starting chain of row 8, and the first dc stitch. To make the flap over the cozy, I slip stitch three times along the row 8, the previous dc stitches, before making a chain 3 turning chain. Row 1 - 2: ch 3 starting chain, dc in each of previous dc stitch x 12 times. Row 2: turn, ch 3, dc in each of previous dc stitch 12 times. Row 3: make a button hole here, so ch 2, hdc in each of previous dc stitch x 4 times, the chain 4 for the button hole loop, then dc stitch in each dc stitch from previous row, do this to the end, which will give you 3 more stitches, then dc on top of previous turning chain. Row 4: ch 2, hdc in each stitch from previous row, and 4 hdc along the chain 4 space which is the button loop itself. Continue to hdc to finish this row. This little cozy is now used as a wrist bag for my kid in dress up play. I did not get to put my mobile phone in it, as someone is using it as a play toy for dress up. Looks like I need to make another one. After trying the first star appliqué, I made this second star into a headband. For the star pointed corners, I crochet 3 chains, instead of 2 chains, as indicated in pattern. Once star is made, I crochet the band using double crochet stitches, around 28 rows, each row with 6 double crochet stitches, including the turning chain. To finish, I just join to the star motif using single crochet stitch. A very short yarn stash buster project. Headband suits a 4 year old girl, with head circumference of around 19" - 20 1/2" (48cm to 52cm). Measurement of headband: 19" (48cm) circumference x 3.25" (8cm) height for the star motif. This will be adorning my little girl's head soon. Thanks for checking out what I am up to today. A very short post on my yarn stash buster project. Just finished doing some beanies, so still have bits of pink, blue and white yarn left. Found this on pinterest, thought I try it myself. Some other crochet motifs I would like to try would be: animals, heart shapes, flowers, butterflies, birds, Christmas motifs for tree decoration etc. Maybe incorporate these motifs into scrapbooking project, gift tags or greeting cards. Just keep a stash handy for some craft ideas in future. crochet star appique or decor for Christmas tree? round 3: ch 3, *2 dc in 1st st, 1 dc next st, 1 fpdc next st**, repeat from * to ** throughout, to finish, 2 dc in last st, then ss to ch 3 of turning ch. Continue to increase till round 5, then no more increases from round 6 onwards. 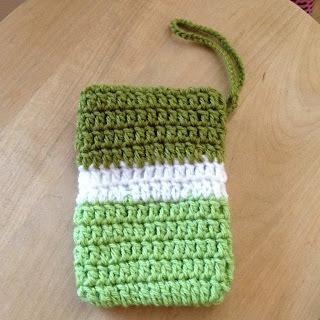 Last two rounds were made from front post half double crochets and back post half double crochet stitches. Sized to suit a baby's head with 14" to 17" (35.5cm to 46cm) circumference. THIS BEANIE FEATURES A TEDDY BEAR APPLIQUÉ. READY TO SHIP NOW. For sale on Etsy. For this hat, I modified the pattern to give me equally spaced out cable designs. Last three rounds of ribbing were made from front post double crochet and back post double crochet stitches. Sized to suit a baby's head with 16" to 18" (35.5cm to 43cm) circumference.